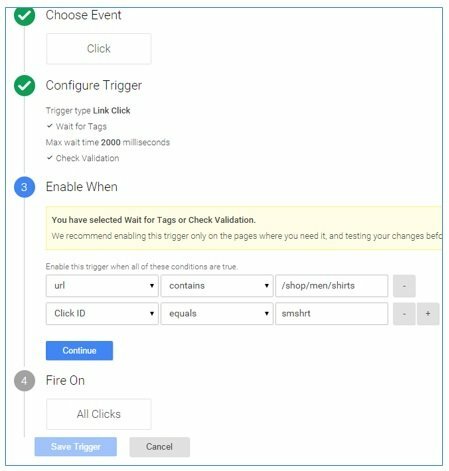 #2 Click – fire the trigger when a click event occurs. #3 Form – fire the trigger when the form submit event occurs. #4 History Change – fire the trigger when the user’s current browser history changes. 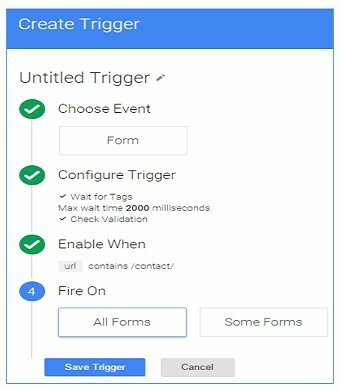 #5 Custom Event – fire the trigger when the custom event occurs. #7 Timer – fire the trigger after a given interval. 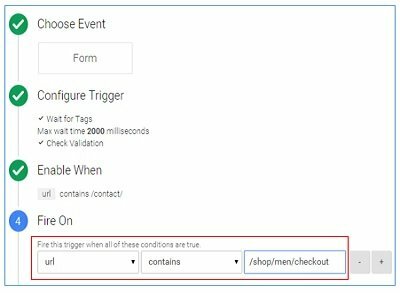 In GTM v2, triggers have been made an integral part of a tag creation process, so you can not create a tag without first creating corresponding trigger. 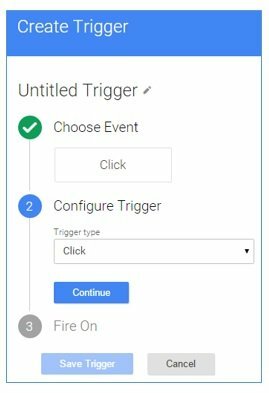 There are two methods of creating a trigger in GTM v2: one is while you are creating a new tag and one is through the triggers menu. More – click on this button to select an existing trigger or to create and select a new trigger. If you select ‘Click’ from the drop down menu, your tag can fire on any click on your website, no matter which element a user clicks on. If you select ‘Link Click’ from the drop down menu, your tag will fire only on clicks on a link(s). Select the checkbox ‘wait for tags‘ to delay the opening of the links until all dependent tags have fired or specified time (i.e. max wait time) has elapsed, whichever comes first. Select the checkbox ‘Check Validation‘ if you want the tag to fire only when the link has actually being clicked i.e. the click on the link takes a user to another page. If you select ‘All Forms’, your tag will fire on submit event for any form. If you select ‘Some Forms’, your tag will fire on submit event but only for selected forms. While configuring your ‘Form’ trigger you get the option to select ‘wait for tags‘ and ‘check validation‘. Select the checkbox ‘wait for tags‘ to delay the form submit until all dependent tags have fired or specified time (i.e. max wait time) has elapsed, whichever comes first. Select the checkbox ‘Check Validation‘ if you want the tag to fire only when the form is successfully submitted. If you keep this checkbox unselected then the tag may fire even when a user is just trying to submit the form.